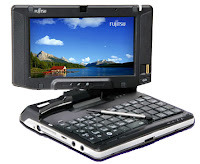 The Fujitsu Lifebook U810 is probably the smallest tablet convertible from Fujitsu. If you're tired of lugging around a heavy laptop, then the Fujitsu Lifebook U810 is your perfect mobile companion. SPECIFICATIONS: The Fujitsu Lifebook U810 has a 5.6 inch LCD display and weighs around 1.56 pounds. Unlike other Ultra Mobile PCs, the Fujitsu Lifebook U810 is a convertible notebook which means if you're tired of trying to tap on the small keyboard or scrolling using the pointers, just flip the screen around and use your fingers or the stylus. Other specifications of the Fujitsu Lifebook U810 includes an Intel A110 800 MHz Processor , 1 GB DDR2 memory, 5.6 inch Crystal View Touch Screen display, 40 GB hard disk drive, RealTek ALC262 Audio Codec, Bluetooth 2.0, Atheros Super AG 802.11 abg wireless connection, 1 USB 2.0, VGA external display, audio-in, audio-out, power adapter DC-in, Type I/II CF card slot, 1 SD card reader, and integrated web camera. Advantages: The first advantage of the Fujitsu Lifebook U810 is that for an Ultra Mobile PC, it is fairly cheaper than it's competitors with its price running at just $1,000. Since the Fujitsu Lifebook U810 is a convertible laptop, that's another plus factor since other UMPCs are only "laptops". The Fujitsu Lifebook U810 also offers a variety of input options; keyboard, touch screen, and mouse pointers. Video playback quality on the Fujitsu Lifebook U810 is also pretty decent and battery life is average. Disadvantages: I think that there could be more room for a screen on the Fujitsu Lifebook U810 if the manufacturers will just make the screen border a little less thinner. I mean, sure, they have to put the fingerprint reader and the web camera somewhere but there's nothing on the left hand side so maybe they could work on the engineering design of the Fujitsu Lifebook U810 if they want to release a 2nd generation of the device.